Pre-Thermomix I ate the standard Western diet and followed the food pyramid. I ate lots of carbs such as bread, rice and pasta and thought eating low fat foods would help with my weight managemen without knowing how much sugar was in these low-fat products. Over the years I have struggled with my weight and I was a constant yo-yo dieter. essential fats like avocados, nuts and seeds, and oils like olive oil and coconut oil. I generally agreed with this approach and I considered it to be ‘clean eating’. It’s what I would loosely describe as a ‘body builder’s’ diet. Lots of protein and good carbs to build muscle. I was eating less crap and instead eating more food. Being a self-confessed fussy eater I didn’t mind this approach to eating. It was simple and easy to plan and prepare. Then I went to my first Thermomix demo and started imaging how much easier it would be. All the foods I would steam in the Varoma. All the green smoothies and bliss balls I would be making. I just thought my Thermomix was going to save me time. Saving time was the what I had ticked as the most important benefit to me when I filled out my feedback questionnaire at the demo. 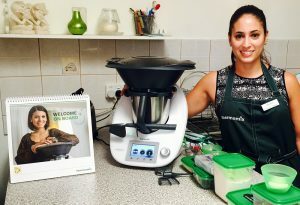 Little did I know my Thermomix was going to open me up to a whole new world. And by whole new world I mean the world of whole foods. Whole foods are foods that are as close to their natural state as possible. They have been processed or refined as little as possible and are free from additives or artificial substances. My diet had been one full of ALL types of processed foods. I had never given a second thought to what was in these processed foods. But once I started cooking from scratch I started to change my thinking. I started buying more whole foods and less processed foods. One thing that really helped me shift my thinking was seeing something in the supermarket and thinking “I can make that in my Thermomix”. So now my idea of clean eating was shifting from a ‘fuel your body’ frame of mind to a ‘nourish your body’ mindset. And that was when I discovered the acronym JERF. Just Eat Real Food. It’s so simple yet it was something that I wasn’t doing. 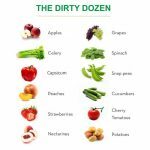 EWG’s Shopper’s Guide to Pesticides in Produce recognizes that many people who want reduce their exposure to pesticides in produce cannot find or afford an all-organic diet. It helps them seek out conventionally grown fruits and vegetables that tend to test low for pesticide residues. When they want foods whose conventional versions test high for pesticides, they can make an effort to locate organic versions. 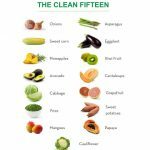 After they released the guide this year Thermomix in Australia made these great little graphics of the Clean Fifteen and Dirty Dozen for 2015. These guides helped me go organic within my budget and helped me understand the importance of going organic. To help with shopping organic it is great to shop at local farmer’s markets. You can buy organic at supermarkets but it’s better to shop local and support your local farmers. Click this link to my Guide to Organic Produce in Perth. Shopping locally also means you shop seasonally which was something I had never thought about. Because I had been a supermarket shopper I was used to buying my fruit and veg all year round. I will admit I never knew which fruits and vegetables were in season at different times of the year. And this brings me to another acronym. SLOW. Eating SLOW means eating Seasonal, Local, Organic and Whole foods. Again, something so simple but something I hadn’t been doing.